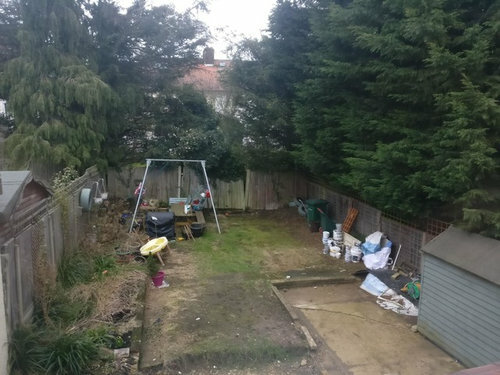 New Garden Needed - Please Help! 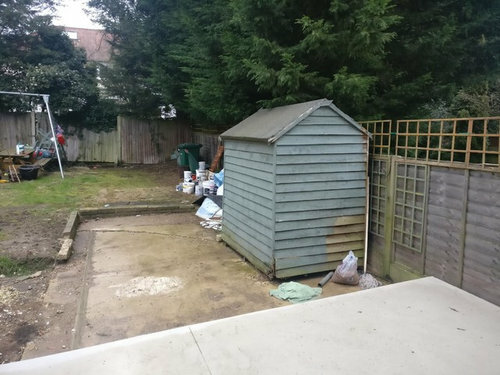 We're looking for some ideas to use our garden space for some flowers/herbs, but also some space for entertaining/bbq and a large shed at the back. We have a young son, so a bit of grass for kicking a ball or laying a blanket down to get some sun would be a must. 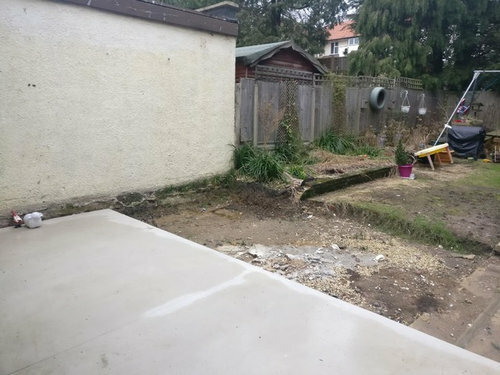 As you can see from the pictures, we have a new concrete patio and our neighbours existing extension wall, that we'll look to cover with something. There are also large trees on the east side of the garden that block a lot of sunlight, so we only get patches of sun on the west half of the garden from morning until early afternoon. No grass grows on that East side by the trees, so thinking we'll put the shed up the back there and some sort of paving. 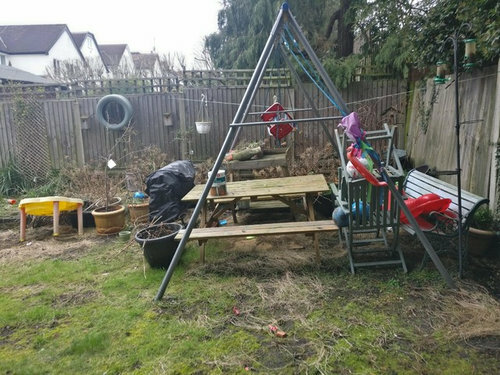 Would also like some sort of fire pit or an area for that as well as a BBQ for the summer. Any suggestions or ideas would be appreciated! The main issue is that in Summer, only the left hand side of the garden gets any sun and that's only in places as the sun moves around our neighbours house and the trees. We'll trim the trees back a little, but that's the most we'll be able to do with them, which may not give us much (if any) extra sunlight. An advice or recommendations would be extremely appreciated! 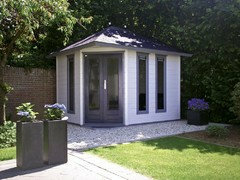 Love the rear of your house which deserves a great outdoor space. My starting point would be to have a polite conversation with your neighbours about getting the conifers topped to a more acceptable height. Perhaps you could invite them in for a social visit and broach the subject. They would then appreciate your point of view. 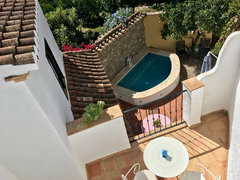 You mention a firepit which is a great idea, it can be a BBQ for cooking as well, a real focal point for entertaining. Lithic Fire crafts stone firepits in kit form delivered all over the UK. 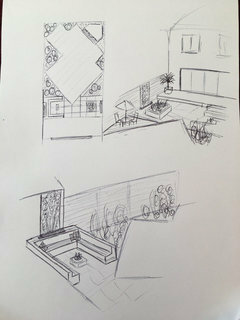 Your garden designer could incorporate one into the design. The grass looks in really poor condition and with the lack of sunlight it is never likely to be that good. I'd consider using artificial grass. It would also save having to have a lawn mower and somewhere to tip the grass cuttings. A play house with storage for your son's toys would be a good idea. Thank you embzop, I was considering artifical grass, but considering the slope, would this need to be levelled? I'm not sure how the drainage works with artificial grass to avoid having large puddles everywhere? 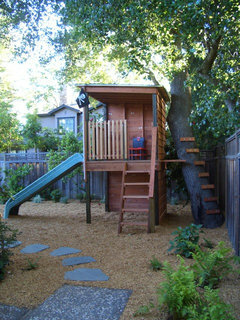 Love the idea of a playhouse too! Thanks, Steven. Wow, thank you rachelmidlands, that really opens it up! I understand what you mean about the trees, we obviously want to have good relationships with our neighbour, so will broach the subject again when we get someone to give them a haircut. He may be open to it, if I offer to pay some of the cost.. Thanks so much for the sketches, they're fantastic. I think you're right with the location of the firepit, that's where there is some sun in the early afternoon. I never thought about the shape of the garden in the way that you have done it, so has given food for thought! This has broadened our thinking, so thank you. Steven. You’re welcome. I’m not a professional by any means so for this kind of design I’d consider getting a garden or landscape designer on board, plus they can offer alternative ideas according to budget, requirements, etc. But it is possible to d.i.y. Some of the best gardens I’ve seen are ones that have been slowly put together bit by bit as and when needs and budget allows. Hope all goes well. Yes, your neighbour's trees are huge! And they're invading your property more than 1 meter in some areas.... as rachelmidlands says, there must be regulations about this. You can also try to approach the neighbour with a mediator to try to achieve a friendly agreement. I attach some photos of small plunge pools, raised form the floor level, so they can be used as a nice bench area near the water. It will also be nice to have a stone wall covering part of the walls. 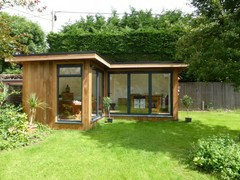 A low cost option will be planning an area were fitting a temporary swimming pool in summer. I'm sure your children will love it. The layout will need to introduce movement, hide some areas of the garden, and put planting in the corners to blur the boundaries. Think about setting it on 45 degrees? Use evergreens such as Choisya and Osmanthus to hide areas, and possibly an evergreen Clematis armandii trained along neighbour's extension - depending on light levels. 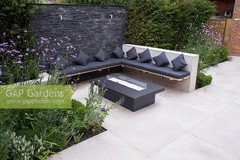 Try the sunken fire pit with raised seating made from sleepers. When planning the news, leave an 80cm wide path around the sides and back - kids love playing chase and hide and seek along these, and they also help make maintenance easier. Unfortunately I suspect when you cut back the conifers on your side it might well be lighter but the conifers are going to be really ugly because there will be no green growth left. I think it would be worth the expense of convincing neighbour to let you remove them probably at your own cost because I bet he’s not bothered since he’s allowed them to get too big. Good luck. Fingers crossed for you that neighbour is more willing than anticipated! Thanks for your suggestion Mirasur Proyectos SL, I haven't considered a splash pool, but if I did leave near the Mediterranean, I'd certainly consider it! I just don't think the British weather warrants one! Eliza Gray Gardens this is very useful thanks, it certainly helps plan and to work out what stages I need to tackle this in. Really appreciate your feedback on the plants too. Thank you. It's a tough one Emily, I don't really want to cut the trees down, but would probably consider it if our neighbour gave us permission! Someone else also mentioned that they look really ugly when we trim them back, so will have to see it what it looks like first and then take it from there. Thanks. have you considered changing your fence panels? Because many people make the mistake of overhauling their garden space and forget about the fence. Just thinking your current panels may look a little out of place if you decide to go with some of the helpful suggestions above. Secure a Field Ltd yes, that's a consideration, they've been there for many years. Thanks for the tip! 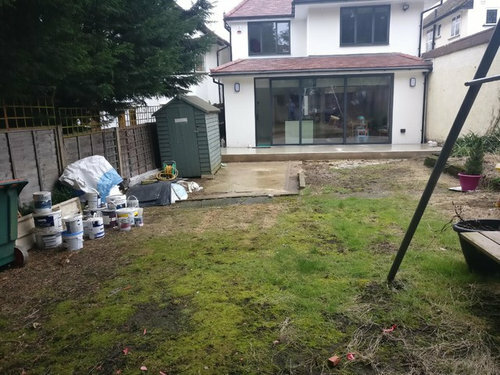 Hi Steven, we have lots of inspiration on our customer project section on the website.. https://www.jacksons-fencing.co.uk/the-edit?category=Customer%20Projects. All the best with your garden project :). The law changed regarding Leylandii and we had similar issues. Rather than go down the council route we approached the wealthy landowners who were too tight to maintain the trees and we cut them ourselves with a scaffold tower. I think the reason these monsters get so big is the cost of tree surgeons (even though they are worth every penny). 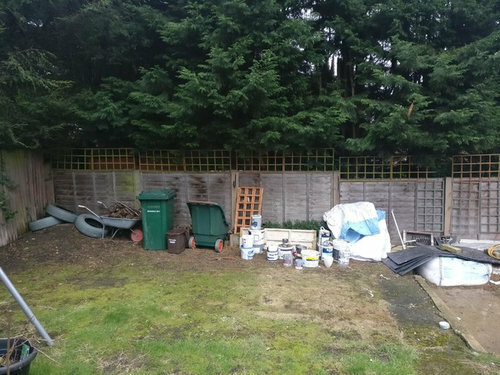 Is it worth approaching your neighbours about splitting the cost of doing this? Thanks colourhappy, I'm going to get a couple of quotes of giving them a haircut and then bringing them down to an appropriate size. 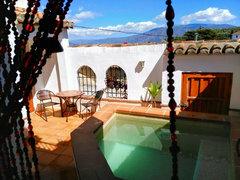 I can then speak to my neighbour, I even think our neighbours at the back of the property would be benefit from a bit more afternoon sun as well! Thanks! I need help on garden design please! 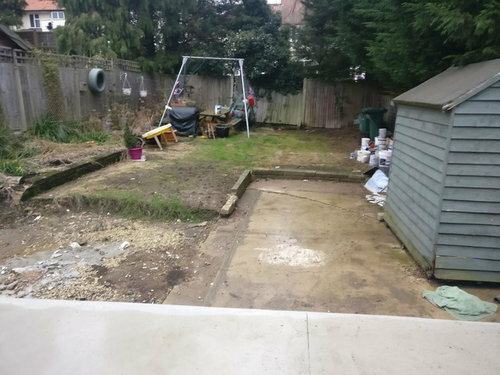 Please advice for my new garden design and why to plant as well !!!! !